80 cards. Click here for a comprehensive look at the entire set including images of every card and team info. PARALLEL CARDS: Blue #/99, Gold #/50, Orange #/25, Red 1/1, Printing Plates 1/1. 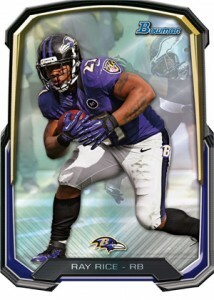 2013 Bowman Football is a more traditional set for the Bowman brand. As always, the main focus is on rookies. But rather than going with a completely different look and feel like 2012 Bowman Football, long-time Bowman collectors may feel more at home with the Chrome cards and colorful parallels. 2013 Bowman Football has the first rookie cards from Topps of the 2013 NFL Draft class. The checklist has more than 100 first-year players. Like baseball, 2013 Bowman Football mixes both base and Bowman Chrome brands. Rookies and veterans have different designs. Black, Prism and Printing Plates are all hobby exclusives. On top of all these, there is also 220 Silver Ice parallels, which fall two per box. Gridiron Ice (#/50), Red Ice (#/25) and Purple Ice (#/10) versions round out the large parallel chase. Bowman Chrome Refractor Autographs, which fall four per ten-pack hobby box, feature on-card autographs. Collectors can expect a huge checklist of up to 80 different signers. Besides Printing Plates, there are seven numbered Refractor parallels: Blue (#/99), Gold (#/75), Orange (#/50), Red (#/25), X-Fractor (#/10), Prism (#/5) and SuperFractor (1/1). 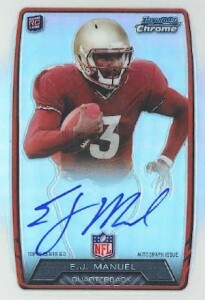 2013 Bowman Football also has Dual-Signed Chrome Refractor Autographs, again, with on-card signatures. Bowman Mini cards have a checklist of 110 players. Falling one per box, they are based on the 1952 Bowman design. Bowman Mini Autographs feature more rookie autographs. Red Ink parallels come numbered to 5. The Bowman Black program makes its gridiron debut with autographs from top first-year players taking part in the 2013 NFL PLAYERS Rookie Premiere. Numbered to 25, the cards have a dark background and a silver signature. Bowman Black cards are all redemptions. Veterans get some insert love in the Bowman Die-Cut insert set. Three cards are in every hobby box with a checklist of 50 cards. The foil-based design has three parallels: Prism (#/99), Blue (#/25) and Red (1/1). Good: On-card rookie autographs. Five hits per box. Tons of parallels and inserts. 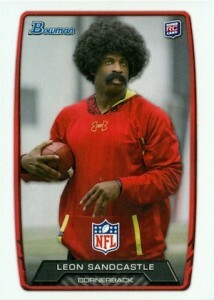 Bad: Lack of NFL uniforms on the rookie cards. The Bottom Line: Between the on-card autographs and relic hits, and the many parallels, there is a lot to like in this release. The airbrushed college jerseys on the rookie cards are disappointing, but that is the price you pay to be one of the first licensed products of the year. The veteran base cards feature the Bowman insignia at the top of the card and the team logo is positioned on the bottom. The rookie subjects share a similar design with the notable exception being the "RC" logo on the top of each card and the team logo being centered on the bottom of each card. I like the placement of the team logos on the base and parallels sets. 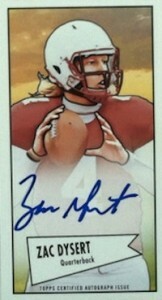 It would have been nice to see the same style used on the chrome autographs, in place of the NFL logo. While I am sure most collectors would trade an early release for the team logos and jerseys, the on-card autographs make that much easier to overlook. Dropping at only one per box, the relic cards are not a huge element in this product. Overall, it seems that Bowman was going for a futuristic and metallic look with these relics and the foil board really helps achieve that. Also, it is nice that Topps packaged the packs tight enough for the chrome cards to not come out with with extreme warping. Putting the autograph in the middle of the 25-card pack was a great idea. The 2013 Bowman Football release is absolutely loaded with parallel variations and inserts. There are going to be a lot of happy player collectors and set and rainbow builders. Although there are not as many obvious "star" rookies this year, don’t sleep on those middle and lower round picks. Tom Brady was a sixth round pick and Johnny Unitas was cut by the Pittsburgh Steelers before going to Baltimore and becoming a legend. More recently, Alfred Morris was a great mid-round value rookie in 2012. While we didn’t score any gigantic hits, the end result includes a good amount of value for the money. At current prices, the cost is justifiable based upon the possibilities. In addition, five hits is a nice haul and every collector is guaranteed some good cards, even if the players featured are not the most ideal options. 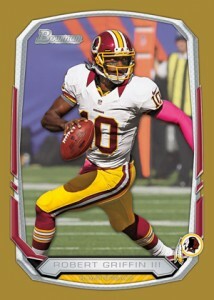 As mentioned above, 2013 Bowman Football is the first NFL-licensed product to debut for the new season. 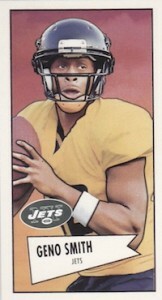 Unfortunately, this quick release prevented Topps from featuring the players in their NFL uniforms. This may turn off some NFL collectors but might appeal more to unlicensed collectors or college collectors. In the long run, it is likely to hurt the rookie card values once other products are released that include the NFL jerseys. 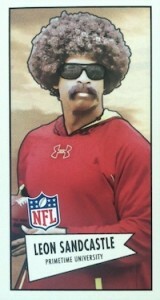 Topps packs a lot of fun into Bowman Football. You can count on four autographs and one relic and that does not include all of the inserts and many colored parallels. This release also includes variations, which adds to the excitement when figuring out if you pulled anything rare. The main downside to 2013 Bowman Football is that you’re likely to pull a lot of low-tiered prospects over early-round stars. 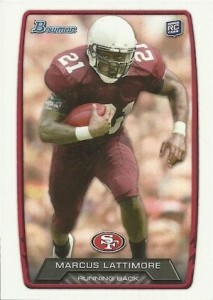 Nevertheless, Bowman makes for a fun product and great start to the football collecting season. I love bowman anything football.I can’t really give this product a full review but I like what I’m seeing so far.There’s a few players in the draft class i’d like to pull and as for base cards obviously would be sweet to nab an Rg3,Martin,Wilson or Luck early 2nd year card.This seems like the perfect box for set AND hit collectors.So let me get this straight 250 total cards per box including 4 autos and 1 rainbow foil relic! sign me up!. This will def be the first 2013 product that i’ll be saving up for. Although it will be pretty damn -near impossible to beat out 2012’s draft class(2012 fueled me back into the hobby like crazy) this is still gonna be an incredible product. can ‘t wait till june! Will there be any non-rookie autographs available in this set? It doesn’t look like it to me. cody carter � A final checklist hasn’t been released yet, but given the brand’s focus on rookies, if there are any veteran autographs I suspect there will be very few. I was super excited for this release, but it looks as though the RC’s are not in pro uni’s. Which isn’t a huge deal, but enough of one for me to limit how much of this product I buy. If anyone knows different please let me know. Shawn � It does look that way from the images Topps tweeted out this week. So close to the draft, it’s tough to get them in full images on a widespread scale. It was the same situation last year as well. This is a pretty fun set, but I do agree that the autos could be vets too and that’d help the set. Also, being a Chiefs fan, I am very confused as to why Alex Smith has no card in this entire set… very disappointed. Regarding the mini autos, specifically the red ink versions. If they are limited to 5 per player, then Mike Gillislee must not have been given a blue pen, as there are 12 of his red ink versions on ebay at the moment! Chuck � Sometimes the numbers don’t totally matchup. I haven’t looked into this instance but I noticed some UFC cards today where the red ink were the base version wen they were the parallel in the rest of the set. Might be a similar situation here. I think you’re exactly right, Ryan, all the Gillislee ebay cards, including those sold, are red autos. So, if any blue ones do turn up, they will be the rare copies. Even rarer will be red or blue autos that are in MINT condition because almost every card that’s pulled out of a Topps/Bowman box will already have dinged corner(s). Hi, I recently bought a box of 2013 Bowman football and I got a Ryan Otten rookie card stamped 1/1. I searched the Beckett website and the set checklist and see that it’s not listed. It’s not a silver ice, printing plate, auto, or anything else. It has a light blue border and stamped 1/1. could you please get back to me with any insight to this card. Ryan � Not sure. Was it out of a hobby box? Ryan � Looking at the checklist we received, I can’t see where it fits. Maybe if you try giving Topps a call, they might be able to help you out. In response to Ryan, I think you pulled the Otten Silver base paper parallel. Not on the checklist but on the pack the odds of pulling this card are like 1:3300. Nice pull. My wife and I picked up several individual packs and 4 hanger packs from Walmart. This years product is a huge improvement over last years Bowman. Card stock, visual appeal, and a nice variety of veteran and rookie cards make this set fun to collect. Isn’t this the true real value of collecting? To have fun doing it? Of course a hit now and then is a nice surprise. I do have a question for you Ryan, I pulled a Joseph Fauria #184. It has a very unusual foil background with what looks like glitter. What type of insert is this? Thank you in advance! Toshi � Sounds like a Silver Ice parallel. Also pulled a of 25 stedman bailey auto and about 6 other numbered cards. I like the inserts a lot they really separate themselves from the base cards. On the card auto are great also. Well worth it. Pulled Julio Jones Relic. 3 variations of Leveon Bell RCs and Johnathan Franklin Rcs. Andrew Luck Die Cut. Great Box!!!!! Hobby box is the only way to go. Pulled some nice autos & some good #’d parallels. Matt Barkley parallel #’d to 25, can’t go wrong with that pull. Like the design, just like Score ’13, looks like these brands have stepped it up a notch in the quality department. I wish I would’ve known it was going to be this good this year. Last year’s Bowman was terrible. 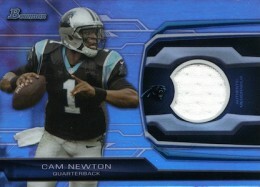 This is probably one of the best Bowman football products I have ever seen. I love all the colored parallels and the on-card rookie autos. Tim hit it right on that the only disappointment is the lack of NFL uniforms on the rookies. 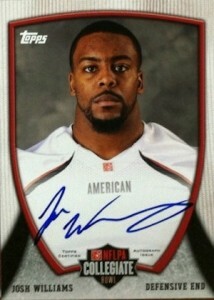 I pulled a Kenny still on card red ink auto but I see it said out of 5 but my card has no seriel number is this normal. Does it mean it Is not out of five even though it has the red ink auto. Really great product. Busted box and got a Kenjon Barner 1/1 mirror parallel that I don’t see on the checklist. Anyone know what it is? I got a great selection of cards. I received 10 mini 52b rookie cards. this site shows one per box??? I must have received a HOT BOX or something..yyeeeahh…. Love the 2013 Bowman, clean look, I like them much better than the 2012 Bowman. Quick question on the Rookie Auto’s. You mention above that most of them feature a player in their college jersey, if it is an NFL jersey is that considered a short print or variant? I love this set. The only thing I am disturbed about is that, there is quit a few cards with no pricing.